In a previous series of blog posts titled Exploring Github DockerHub and OCCS I walked through how to setup your development environment, install Docker, create a git project, link Docker Hub and GitHub accounts, trigger a build of a docker image on Docker Hub and then deploy and run the docker image using the Oracle Container Cloud Service. 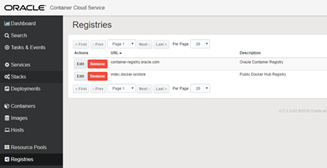 If you want to follow the steps in this blog post you will need a login for GitHub and Docker Hub and also a subscription or trial account for the Oracle Cloud in order to use the Oracle Container Service Classic (OCCS). Read the complete article here.